Discussion in '9/11' started by Jedo, Feb 6, 2018. Tony: "building 7 was the only building on it's block, 2 buildings adjacent next to it..the post off ice and Verizon building got hit by some debris, small amount. Neither one of them had fires. Only building 7. That's the only building that wasnt in the World Trade Center block that had a fire. The other buildings got hit.. no fire. " Mick: "you find that suspicos somehow?" 53:30 Tony: "I think there was a possibility it was arson"
Mick accepts this claim which is repeated later by Tony in the video, where he then even implies that it is suspicious the WTC7 catching fire while the neighbouring buildings did not, and as far as I understood it (the discussion got quite chaotic sometimes), he was even suggesting that the fire in WTC7 originated from arson. In the days after the twin towers collapsed, 90 West Street was celebrated as a miracle building of Sept. 11, because, unlike so many others nearby, it survived. But the building was severely damaged when flaming steel debris rained on its north facade and gouged the exterior. Out-of-control fires raged in the building for days, gutting five floors and major portions of four others. The roof was damaged by debris falling from WTC 2, and approximately half of the north face of the building experienced projectile impact and fire damage. WTC 2 projectiles severed spandrel beams at floors 8 to 11 in the 2nd bay from the west end, and in a middle bay at the 6th floor. Terra cotta slabs were damaged mostly in the exterior bay at these locations. In general, the projectiles damaged only the masonry and broke many terra cotta features. The damage to the interior structural terra cotta floor slabs was primarily due to the brittle fracture of the terra cotta slabs upon impact by large debris. 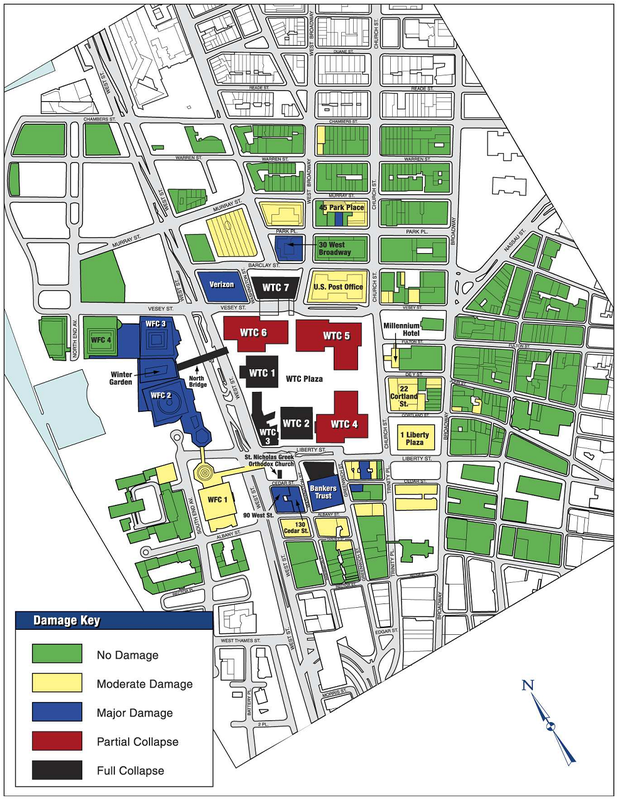 Most of the damage was restricted to the two northernmost bays, with the exception of fire damage on the 1st through 5th, 7th through 10th, 14th, 21st, and 23rd floors. The fire did not spread to the south side of the building, except for the first 4 floors. Columns were buckled 1-2 inches on the 8th and 23rd floors, approximately a foot below the ceiling, as shown in Figures 7-16 and 7-17. A tube column supporting a north exit stair from the roof and a built-up column supporting the roof were the only other heat-induced buckling damage observed during initial inspections. When the south tower fell, falling debris and column sections caused destruction. Parts of my northeast corner collapsed under the debris. A column section from WTC 2 penetrated the 10th floor roof slab. The projectile impacts also lit fires, which occurred primarily above the 9th floor. Fire damage was evident on the 11th and 12th floors in the northwest corner. Several concrete columns were cracked, possibly from the impact. Several bays at the northeast corner were severely damaged from debris impact. Concrete samples from two fire locations indicated that my concrete structure may have experienced fire temperatures of between 315 °C (600 °F) and 590 °C (1,100 °F). Spalling of capitals was observed in the fire areas. Some façade damage was noted (primarily to the parapets), but most of the damage occurred at the roof level where the slab of the northeast corner collapsed under debris with the column capitals punching through the slab. A column section from WTC 2 penetrated the 10th floor roof slab. The southern portion of the building was not damaged. Structural damage from projectile impact and fire occurred primarily above the 9th floor. Fire damage was evident on the 11th and 12th floors in the northwest corner. Several concrete columns were cracked, possibly from the impact. Several bays at the northeast corner were severely damaged from debris impact. Concrete samples from two fire locations indicated that the concrete structure may have experienced fire temperatures of between 315 °C (600 °F) and 590 °C (1,100 °F). Spalling of capitals was observed in the fire areas. Both buildings are adjacent to each other, see e.g. The adjacent Bankers Trust building had no fire according to the FEMA report, which is a completely analogous situation as on the north side of the WTC block, where the Verizon building and the U.S. Post Office exhibited no fires, as tony Szamboti pointed out correctly, but WTC7 did.